In the early morning hours of October 3, 1955, a merchant vessel named the MV Joyita set sail from Apia, which is the capital city of Samoa. The boat was taking 25 passengers (16 of them part of the ship's crew) and four tons of various cargo on a two-day, 270 mile trip across the south Pacific Ocean to the Tokelau Islands. The vessel had problems from the start. It was actually supposed to have left port the previous day, but was delayed due to the port engine clutch failing. When she finally did leave the next day, it was with only one engine. On October 6, the port that was supposed to have received the Joyita reported that the ship had not yet arrived. Since no distress signal was received, authorities assumed the worst and launched a massive search for the vessel and her passengers (primarily aided by the Royal New Zealand Air Force). But by October 12, no signs of the boat of her crew had been sighted. 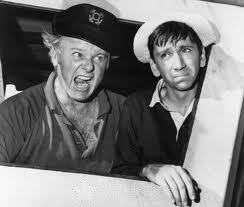 ...and no one had heard the Skipper yelling at Gilligan. Five weeks later on November 10, a merchant ship spotted the Joyita near Fiji. She was almost 600 miles off course, water logged, and missing nearly all of her cargo. There was obviously no one on board, but the ship's emergency radio was tuned to the international distress channel (meaning that the captain had actively been trying to get help). All three of the boat's life rafts and the dinghy were also gone. From the outside, it was clear that something had gone very wrong. For starters, many of the boat's windows were smashed and a makeshift awning/cover had been put up over the deckhouse. There was also a large hole in the ship's superstructure, which (in addition to being adrift at sea for so long) had caused the lower deck to become completely flooded. But although the ship was found damaged and tilting to one side, the hull was completely fine...meaning that the ship was totally sea-worthy. Most of the flooding was due to the ship being adrift and bobbing in the ocean for so long. The ship's odd angle was a result of the water that had come on board over the last few weeks. This makes fact that the life boats and dinghy were deployed not only strange, but completely irrational on the part of the ship's passengers and crew. What's even more perplexing is that none of the four auxiliary crafts were ever spotted. Inside the vessel, however, is where things really started the to get strange. The ship's logbook and all navigational equipment were missing. The medical bag of one of the passengers (who was a doctor) was found with nearly all the equipment removed...and instead filled with bloody rags. (It's worth noting, however, that the portion about the doctor's medical bag is still disputed). The starboard engine was inexplicably covered with mattresses, which was either a result of the worst attempt ever to plug a leak or the aftermath of an incredible game of mattress jousting. "Might as well have some fun if we're all gonna die!" The crew had also apparently tried to rig together a pump to offset the flooding in the engine room. It failed (obviously), but that at least shows that they were trying to keep the ship from becoming stranded in the middle of the ocean. 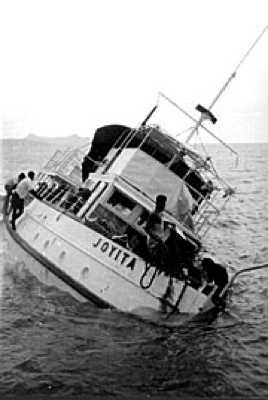 But even with the engine room being turned into a swimming pool, the Joyita was still able to stay afloat. The fact that the ship's cork-lined hull (and remaining cargo of empty fuel drums) would keep her afloat should have been common knowledge to the 16-man crew. Bizarre behavior (and alleged bloody rags) aside, what would possess 25 people to leave the safety of seaworthy vessel stocked with supplies to go out into the Pacific Ocean on small life rafts? It was discovered during the recovery that the ship's emergency radio was busted, giving it a very short range of only two miles. This would explain why a distress call was never received. It's also worth noting that all the ship's clocks were stopped at 10:25. While that makes for a fun jumping off point for wild paranormal speculation, it actually just means that ship's generator cut off during that time in the night. 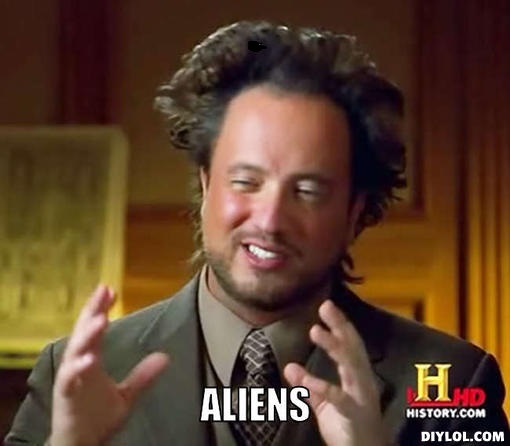 But that still doesn't explain what happened to the passengers and cargo. One theory posits that the captain, Thomas "Dusty" Miller, got into a fight with his first-mate, Chuck Simpson. The two beat the crap out of each other so hard (hence the bloody bandages) that they were incapacitated. This would have left the ship without an experienced seaman...and also apparently would have dropped the IQ of everyone on board by 30 points. Another theory was that the Joyita was attacked by Japanese fisherman or still-active Japanese Nazi forces. This line of reasoning seemed to be fueled more by post-World War II sentiment in the Pacific towards Japan rather than any sort of solid evidence. Other theories about mutiny and possible insurance fraud have continued to pop up over the years. But none of them can account for the fact that no trace of the ship's passengers or crew were ever found. It's very possible that the ship's cargo could have been scavenged before the Joyita was officially located in November of 1955, but even if the crew had all been killed by pirates, there should have at least been some type of wreckage discovered from the ship's four auxiliary craft. After being repaired and auctioned off to a new owner in 1956, the ship proceeded to run aground twice during the next three years. A mechanical malfunction (due to improperly installed valves) would be the third and final straw. The Joyita's reputation as an unlucky ship/potential death trap had made her unwanted and unloved. She was scrapped for parts and eventually purchased by British author Robert Maugham, who used the ship for inspiration while writing 'The Joyita Mystery' in 1962.
tortured souls that the Joyita had claimed over the years. To get updates on when new articles or podcasts are published (and occasional random musings) 'Like' the official RamblingBeachCat.com Facebook page. 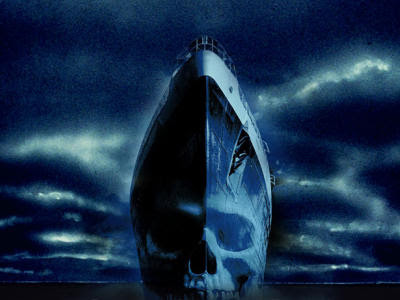 Every time someone does, another ghost ship decides not to eat its passengers.